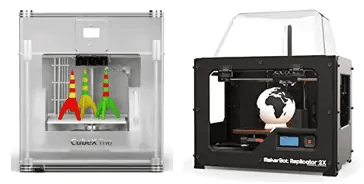 Cubify CubeX vs Replicator 2 3D Printer - Which One is the Best? It may seem like the upsurge of desktop 3D printers happened just yesterday, but it has been nearly three years. Cubify, the subsidiary of 3D Systems, launched an easy to use 3D printer in direct competition with MakerBot, for a fairly reasonable price of $1300 called the CubeX. While it essentially followed the same design structure, it offered a great deal of functionality, initiating what is now an ongoing struggle for supremacy in the 3D printing game. Over the course of these past three years, both 3D printer manufacturers have gone all out with superior models. The Cubify CubeX was a breakthrough model in desktop 3D printing due to its relatively compact size. MakerBot on the other hand, released a $2,800 model, Replicator 2X with dual extruders. Cubify followed suit by developing the $4,000 CubeX Trio, featuring three extruders. With all the developments, it can become difficult to choose a 3D printer that offers improved functionality. However, by the end of this comparison review, you’ll have your mind made up on what to shop for! Note: Purchase rates of models mentioned above relate to the prices at the time of introduction. The Cubify CubeX Trio, as opposed to the duo and single extruder versions, is equally functional in ABS and PLA printing. Similarly, the MakerBot Replicator 2X also supports ABS and PLA plastic, but is pushing its PLA printing, since the material is harder than ABS, has relatively low odor, and is biodegradable. The Cubify CubeX Trio has three extruders and allows you to work on prints using three different colors. While the extruder is easy to load, CubeX Trio does not have a heated build platform. As a result, you may not get high quality prints but you do get more colors in them. In comparison, MakerBot Replicator 2X has two extruders but only allows one color per print. There is no easy load feature in the extruder, but the Replicator 2X does sport a heated build platform that allows high quality prints. The CubeX Trio weighs 84 pounds and features an LCD screen in front of the chassis to account for its use. The maximum build size for CubeX Trio is 7.3” x 10.75” x 9.5” inches. The CubeX Trio uses Plastic Jet Printing technology to produce fine prints. The MakerBot Replicator 2X in comparison, is lightweight and weighs only 28 pounds. The Replicator 2X also is one of the most compact 3D printers available with a maximum build size of only 9.8” x 6.3” x 5.9” inches and an LCD screen in the front for easy operating. The Replicator 2X uses Fused Filament Fabrication technology to produce fine prints. Generally speaking, the best 3D printers available in the market today have at least two connection modes with a computer. In this instance, the Cubify CubeX Trio has only one, through a flash drive that comes with 10 built-in free printing designs. You can use the flash drive to save files and print directly. On another note, the CubeX Trio has compatibility issues with Linux OS, but works efficiently on all versions of Windows and Mac. As for file support, CubeX Trio only supports .stl file types, which means that you can only work with a limited number of files. The MakerBot Replicator 2X supersedes the CubeX Trio in connectivity, as it features both USB and SD card modes. Hence, you can easily create and print designs through a USB drive or SD card. In addition to that, Replicator 2X works seamlessly with all versions of Windows, Mac, and Linux. It also has three supported file types, .obj, .thing, and .stl respectively. This allows you to work on a wide range of files and designs conveniently without having to spend more time converting them! Cubify CubeX features intuitive 3D software for modeling called Invent. The software as a standalone product costs $50, but is available for free with a CubeX Trio purchase. The MakerBot Replicator 2X uses a free open source software called MakerWare that allows you to slice objects to make them print-ready. That being said; you can use any 3D modeling software on the Replicator 2X printers. The Cubify CubeX Trio is essentially built for beginners and features an intuitive and fairly simple to use software to create and edit downloaded files. With the CubeX Trio, you get 10 free built-in 3D designs that you can play with, before starting to print your own designs. The box includes a starter filament cartridge, power supply, flash drive, and maintenance tools. The MakerBot Replicator 2X comes with a USB cable, power supply, and maintenance tools. Hence, you have to purchase the filament cartridge as it is not provided with the box, and can cost up to $48 per ABS cartridge. However, you can make use of universal ABS filament cartridge from other retailers as well. It’s important to realize that customer support is a necessity in the 3D printing game. In this regard, Cubify and 3D Systems have you covered, as 3D Systems has been in the 3D printing game for decades. You can easily reach the Cubify team on Facebook, Twitter, email, online form, phone, or through their blog. The community blog is an excellent platform to discuss and resolve some issues you might face with the CubeX Trio. Cubify offers a 90-day warranty with the CubeX Trio. The MakerBot support team is also as accessible as the Cubify team, and you can easily reach them through phone, social media, online form, or email. For your queries or technical issues, you can use the community forum and support videos available on the website. MakerBot offers a 6-month warranty on the Replicator 2x. When it comes to matters where two products offer different range of functionalities, the eventual decision should be based on your necessity. For instance, if you want an easy to use 3D printer that can print designs via a USB cable or SD card, then MakerBot Replicator 2X is what you should go for. On the other hand, if you want an easy to use 3D printer that can print large models in both ABS and PLA prints, then the Cubify Cube X Trio will certainly do more than meeting your requirements. Some users may feel that the MakerBot Replicator 2X is a bit overpriced considering that it can only print in one color. However, many others would jump to its defense by claiming that it’s compatible with all major operating systems of today, namely Mac, Windows, and Linux. While it is true that few of the basic 3D printing features are still missing in Replicator 2X, it is nevertheless, a sturdy and easy to use 3D printer. The Cubify Cube X could do a lot better in terms of compatibility and connectivity. That being said; it more than meets up with the demands of high speed and perfect prints with consistency in both PLA and ABS. As of 2015, the MakerBot Replicator 2X is available for $2,499 from Amazon with shipment and tax charges included. On the other hand, the Cubify CubeX Trio is available for $3,247 from Amazon, including shipment and tax charges. Overall, both 3D printers offer high quality prints and are from reliable makers, but I’d have to give the edge to the Replicator 2X because it’s at a much more affordable price point.